Are you thinking about enlisting the aid of an experienced LMS consultant to guide you through the LMS selection process? How do you decide your must-have LMS features, and which ones can go by the wayside? Are you getting a free LMS consultation, but aren’t sure of your LMS implementation schedule? Can LMS Consulting really help you achieve the best LMS value for money? Download our free eBook to find the answers to these questions and much more! buyer’s regret, but is it the right route for your company? Follow these 8 steps to successfully select an LMS vendor who provides the best LMS customer experience and value for money. Determining the corporate eLearning project scope also allows you to improve resource allocation and ensure that all your stakeholders are satisfied with the investment. What should you look for to avoid buyer’s regret and ensure that the system checks all your boxes? Companies who are new to the world of learning technologies may find it challenging to put a ballpark figure on their LMS budget. LMS consulting simplifies the LMS selection process so that you can allocate resources more effectively. How do you decide what goes on the list in the first place, and which LMS features can go by the wayside? Here are 6 common mistakes to avoid when choosing your next LMS vendor after receiving your free LMS consultation. One of the most important pieces of information your LMS consultant requires to compile an LMS recommendation list is your roll-out timeline. These 7 tips can help you get a more accurate LMS user count in order to receive a targeted consulting recommendation list. Maybe, there are signs and symptoms that can tell you it’s time to use LMS selection services to get a new system. Let’s explore 6 of them. Here are 8 top tips to use an LMS software directory after LMS consulting to choose the ideal platform for your organization. Now that you’ve saved on LMS consulting fees, you want to be sure the LMS vendors you use are good. You can do the usual due diligence, ask for referrals and peruse their site. But how else can you vet them? Thankfully, you can use free LMS consulting services to get a head start and take full advantage of their insider expertise. 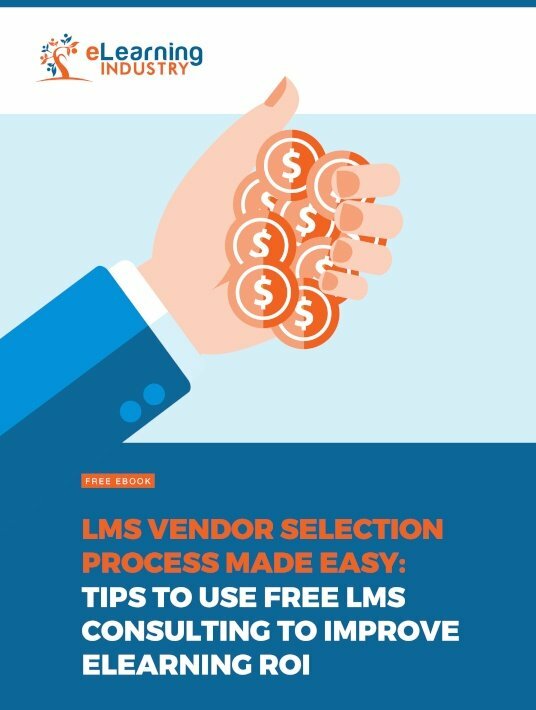 This free eBook summarizes all you need to know about the LMS Vendor Selection Process. Find out about the benefits of using LMS consulting services, the top LMS vendor selection criteria, as well as ways LMS consulting can help you achieve the best value for money. You will also learn how to define the scope of your project, your must-have LMS features and your price expectations prior to free LMS consulting. Furthermore, how to avoid mistakes during the LMS vendor selection process, how to identify that it’s time to switch to a new LMS, as well as valuable tips to calculate your LMS implementation timeline about the ideal date to go live. Download our Free eBook “LMS Vendor Selection Process Made Easy: Tips To Use Free LMS Consulting To Improve eLearning ROI”. A useful tool for every L&D professional. Free LMS consulting services can help you pick something that fulfills your business goals and ensures good eLearning ROI. They’ll develop a more useful shortlist than you would. They do this by clarifying the purpose of your LMS and balancing out departmental demands and preferences. If you’re on the fence about signing up for a free LMS selection service, consider these benefits. A few minutes of your time can help to avoid investing in the wrong LMS that diminishes your eLearning ROI.